St Gallen, Switzerland – July 2017… Astro Spatial Audio has again demonstrated the extraordinary potential of true object-based 3D audio and the incredible performer tracking accuracy of Stagetracker, having broken new ground with a fully immersive outdoor opera produced by Switzerland’s prestigious Theater St. Gallen. With its origins stretching back to the early 19th century, Theater St. Gallen is widely considered to be the oldest professional theatre in Switzerland. But despite its remarkable provenance, the theatre maintains an audio-visual infrastructure that is the very definition of contemporary. It was in this spirit that the company’s production team recently decided to apply Astro Spatial Audio’s true object-based immersive audio to a headline summer production. Open-air performances of cornerstone theatrical and operatic works have long been a staple of the Theater St. Gallen’s busy annual schedule. 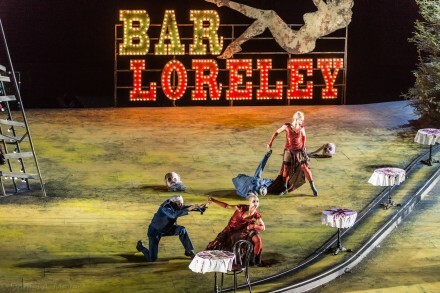 This year it staged a version of Loreley, a three-act romantic opera written by Italian composer Alfredo Catalani in the 1880s. But with the incorporation of Astro Spatial Audio’s object-based technology, Head of Sound Dennis Schmidt – who has been with the Theater for a little over one year – resolved to bring a fresh dimension to the latest production of this much-loved work. At the heart of the Astro Spatial Audio solution is the conversion of audio signals into audio objects. ASA’s SARA II Premium Rendering Engine – a 3U road and rack ready processor offering up to 128 MADI or 128 Dante configurable network pathways at 48kHz/24-bit resolution – utilises extensive metadata attached to each audio object. The result is a precise calculation of that object’s position within virtual 3D space, as well as that object’s acoustic effect on the virtual space around it, gifting the engineer a truly three-dimensional audio canvas on which to play. At Theater St. Gallen, the design also featured ASA’s recently-introduced performer tracking system, Astro Spatial Tracking, based on the world-leading accuracy of the Stagetracker system, supplied for Loreley by 2M Audio. Developed to offer previously unseen degrees of precision and ultra-fast vector-based tracking in all three dimensions, Astro Spatial Tracking is the result of an exclusive collaboration between ASA and Norway’s TTA – developer of the original Stagetracker system as well as the forthcoming Stagetracker II. Marketed worldwide through Astro Spatial Audio, Stagetracker integrates seamlessly with the SARA II Premium Rendering Engine, creating a unique powerful and quick to deploy solution for the production of Loreley. Taking advantage of the SARA II’s MADI connectivity, Schmidt assembled a notably high-end audio system including d&b audiotechnik loudspeakers for the main PA, front-fills, delays and surrounds; a Yamaha audio interface; and a Soundcraft Vi7000 mixing console, among other core equipment. He confirms that even on its inaugural outing at the Theater St. Gallen, the audio team was “able to achieve some really impressive effects – in particular, relating to the tracking and panning of the singers, which I think helped to give the vocal performances a more natural feeling for the audience. It was certainly much commented-upon."